Before her big performance, Janelle Monae posed on the white carpet this evening(June 24th) at the 2018 BET Awards at the Microsoft Theater in LA. 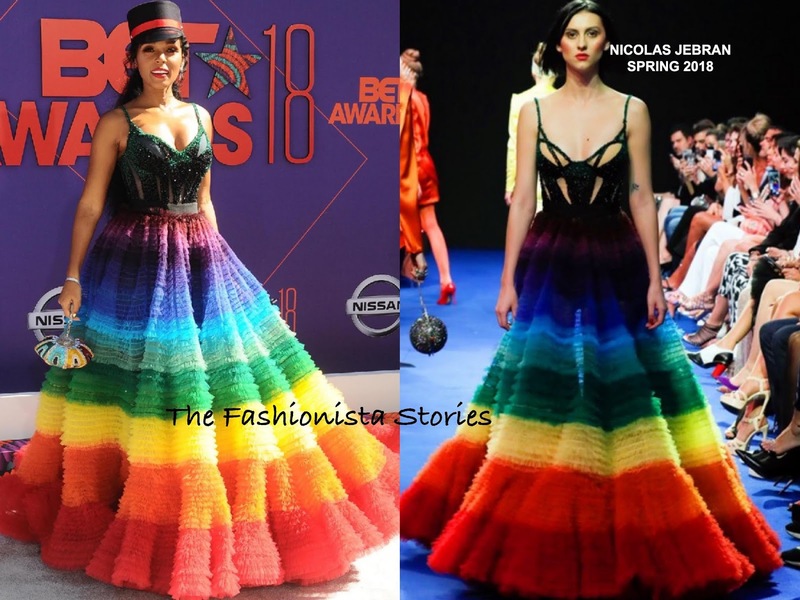 Janelle celebrated her coming out this year and it is pride month, so it is no surprise that she is rocking this rainbow NICOLAS JEBRAN SPRING 2018 gown with the LGBT colors. She is known for wearing only black & white 95% of time so it is always refreshing to see her serve up some color. On the runway, the green beaded bodice was un-lined but Janelle had her bodice lined for the occasion. Janelle tends to over-accessorize sometimes but I think on this occasion, the hat & JUDITH LEIBER bag coordinated with her look. Are you sold on Janelle's look?